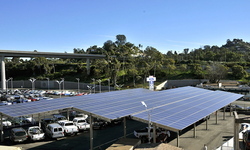 MBMI Metal Buildings, supplier of pre-engineered metal buildings and accessories, in support of going green and energy efficiency, is proud to announce its construction of 6 T-Frame Parking Canopies entirely integrated with Solar Panels at Drew Ford in San Diego, California. The solar panels are attached to steel framing doubling as both a source of energy and a shading system for vehicles. MBMI promotes the use of solar panels to motivate other companies to also be socially responsible by building green. Investing in solar panels saves money in electricity and the actual expense is decreased with a 30-percent federal investment tax credit.